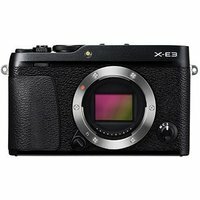 FujiFilms X-E3 builds on the successes of the highly popular X series range of mirrorless compact system cameras. Boasting the same 24.3MP X-Trans CMOS III processor seen in the more expensive X-T2, plus internal 4K recording, and 60p in Full HD, the X-E3 has a lot to offer for a camera at this price-point. The new Touch Function also adds touchscreen functionality similar to smartphones.